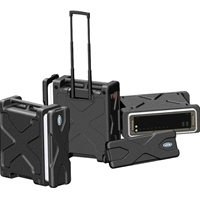 The new Roll-X cases have a depth of 17" and accommodate 19" rack mount equipment. They are made of polyethylene rotationally molded plastic with 2.5" wheels and industrial pull handle. The Roll-X racks also interlock and stack with each other. Rackable Mount Depth: 17 1/2"
Max. Int. Width: 21 1/8"